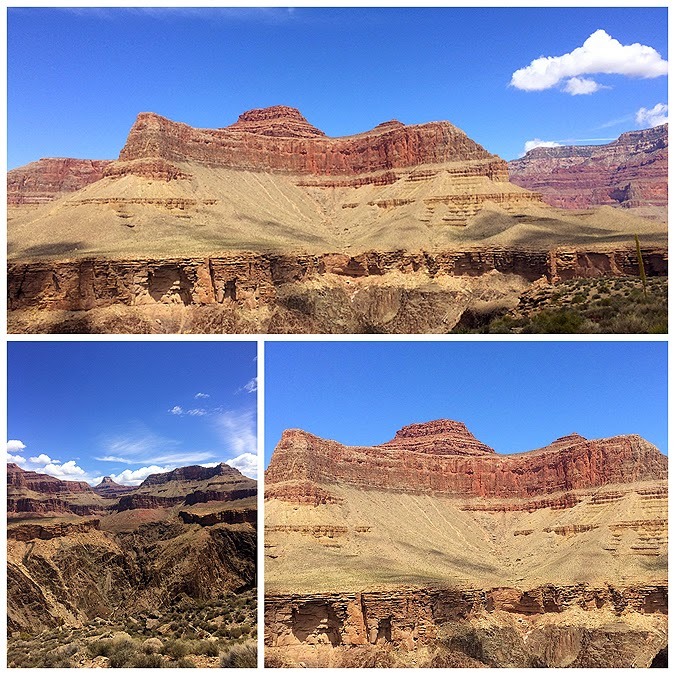 - On Friday at 5pm I started a two week vacation, thirty-seven hours later I was standing at the Grand Canyon's southern rim where I hopped on the free shuttle over to Hermit's Rest. 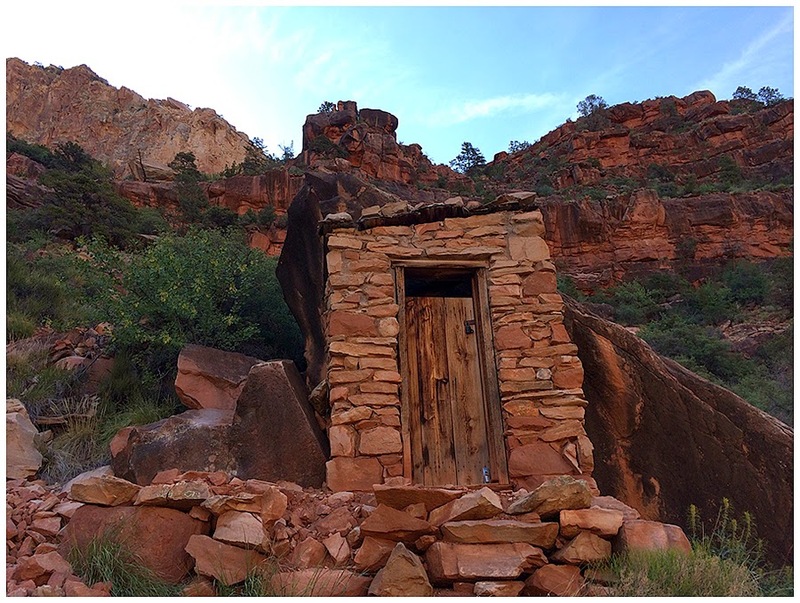 - The first part of my hike was seven miles along the Hermit Trail. 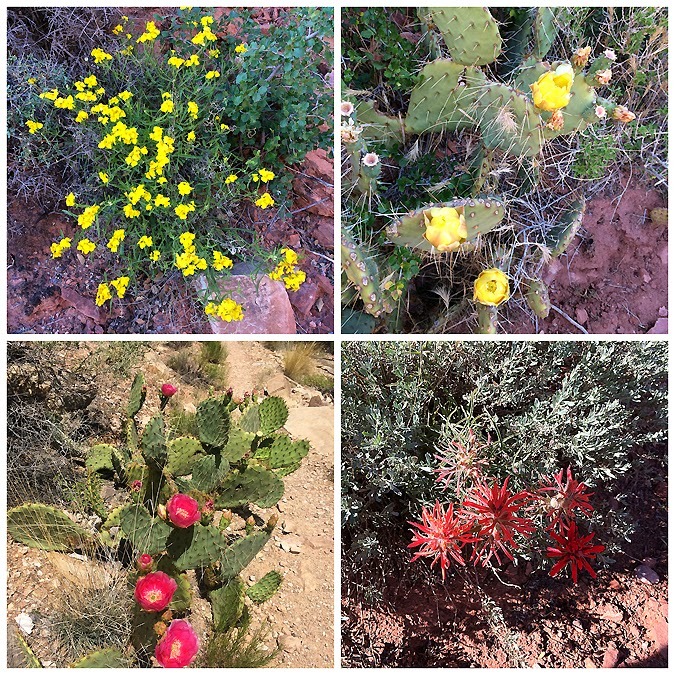 It is considered a more rugged trail by Grand Canyon standards as it is not officially maintained by the park and is rocky in places with trickier footing. Still, compared to what I'm used to in the Whites it had decent to good footing. 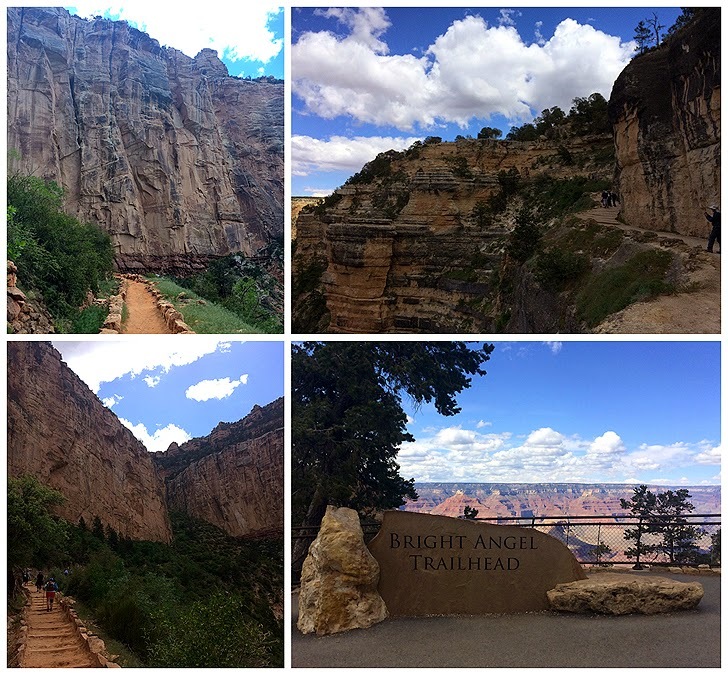 - The Hermit Trail was created in the early 1900's and at the time was masterpiece in trail creation. 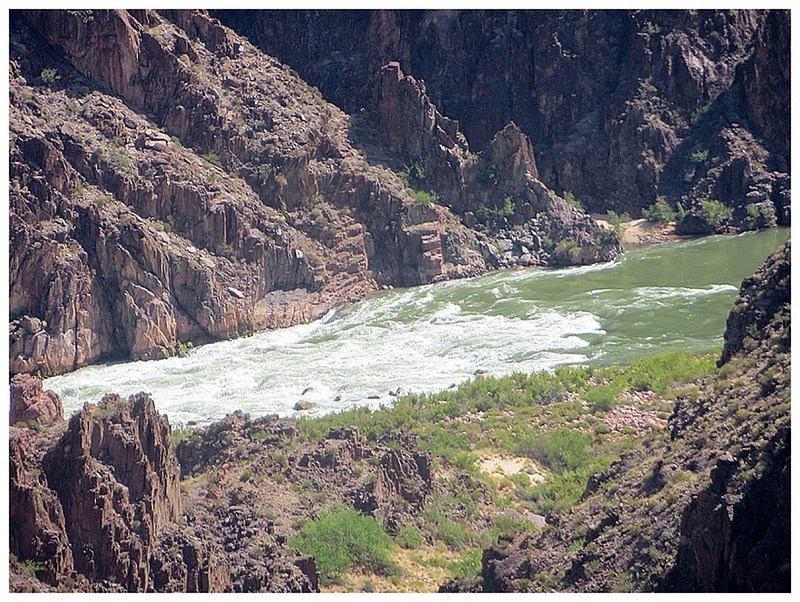 It was considered a state of art rim to river trail with carefully placed stone/rock - slab/blocks creating a cobblestone pathway for most of its length as it dropped to the Colorado River passing by a ranch near Hermit Creek, there was even a tramway set up from the rim to the ranch. 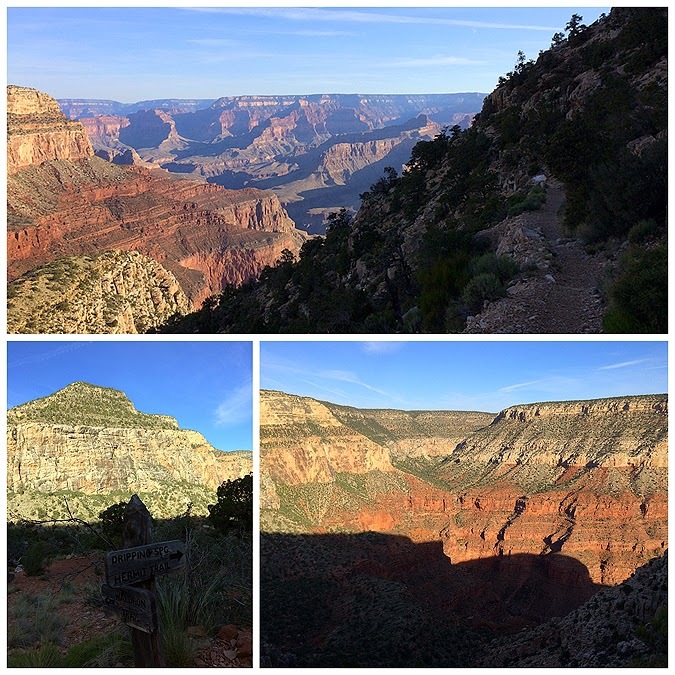 Basically, it was the Bright Angel Trail and Phantom Ranch of the early twentieth century. However, by the 1950's the campsite at the ranch began to slowly fade from prominence and over the next half century much of the carefully laid stone pathway eroded away or was wiped out by landslides. - I started my hike just before 7am with temperatures hoovering around freezing. However, I quickly warmed up as I dropped a few thousand feet in elevation over the first couple of miles. 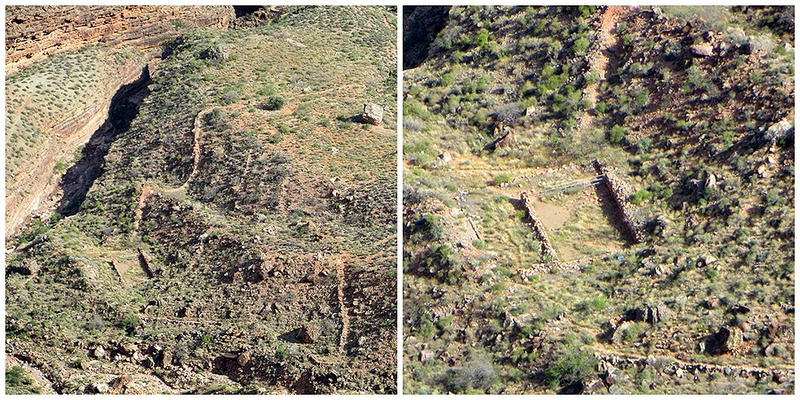 I was interested to see how much of the old pathway had survived, it wasn't much, just a few hundred foot sections here and there. Like most of the other trails I have hiked down in the canyon the Hermit Trail starts off with narrow views as you're surrounded by high canyon walls. Eventually the canyon and views start to open up across the canyon as you pass by Lookout Point and curve around Breezy Point. 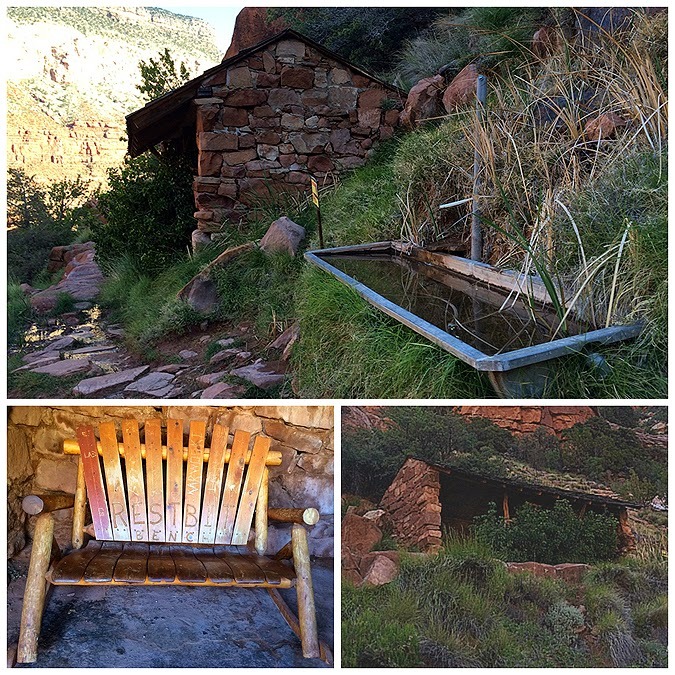 - Along the way the trail passes by the Santa Maria Spring rest house, where one can escape into the shade to cool off. I explored around here a little bit as I spotted two small structures below the rest house, the entry ways were locked, they are either old toilets which have been closed off or some mine shaft entrance. - The hike down to the old site of the ranch was fairly easy, the coolest spot was a small steep section referred to as Cathedral Stairs, a series of gnarly switchbacks that shoots you out onto a long descending ramp below Cope Butte. 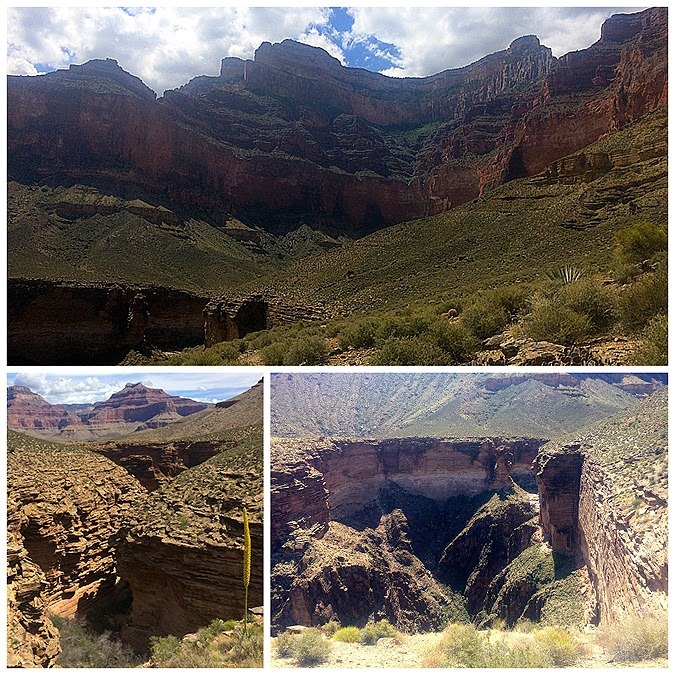 Hiking the trails in the canyon is very unique as you can often see a few hundred to thousand feet below you and can spot the trails meandering below canyon walls or over plateaus. As I was descending below the western portion of Cope Butte I could spot the Tonto Trail even though I was almost two miles away from it. 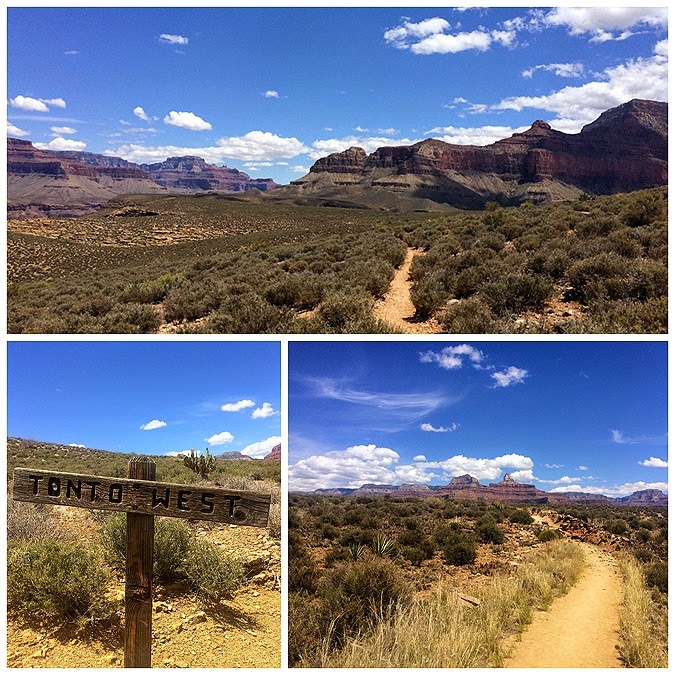 - Eventually I made my way to the trail junction for the Tonto Trail. 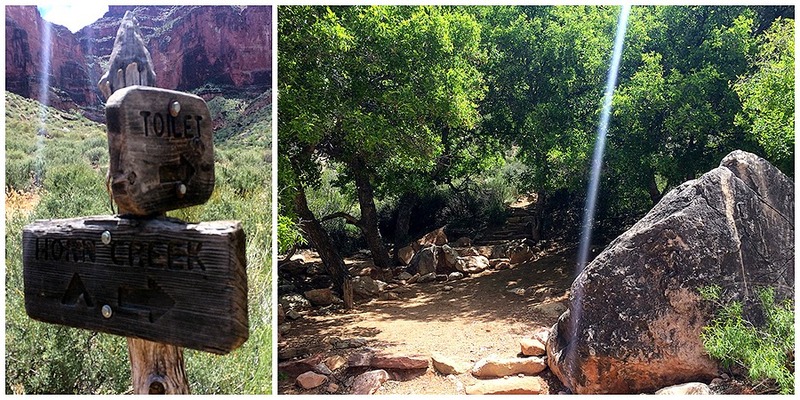 Oddly enough, the sign didn't say Tonto Trail, it had an arrow pointing one way for Hermit Trail and another arrow pointing labeled Monument. 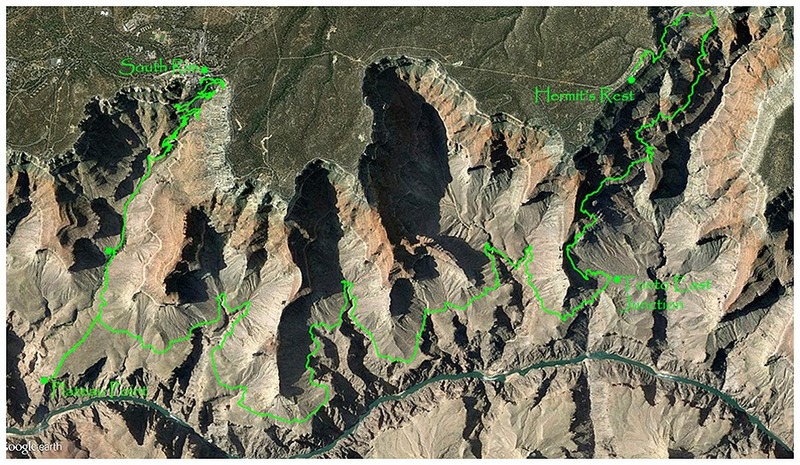 Thank god I studied the map and did some research or I probably would have continued along the Hermit Trail until reaching Hermit Creek! 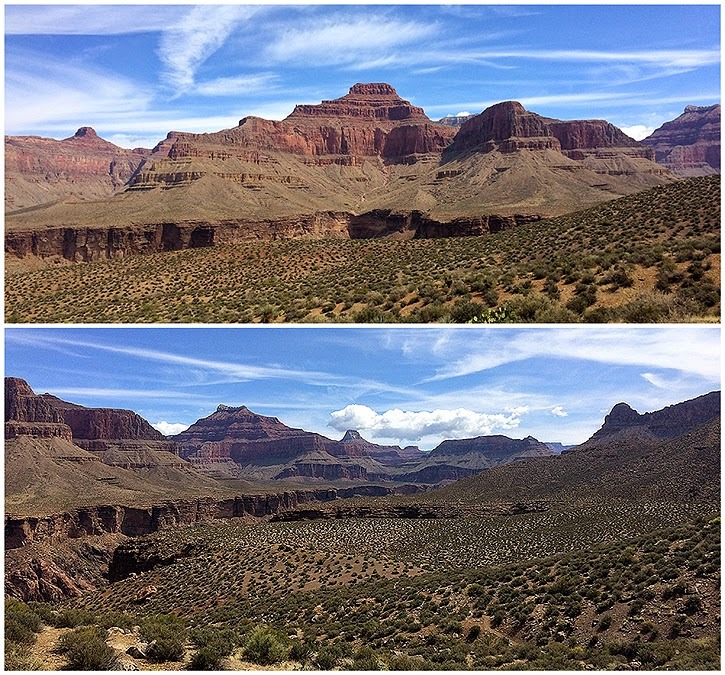 - Now I started heading east along the Tonto Trail, this was the part of the hike I was really looking forward to. 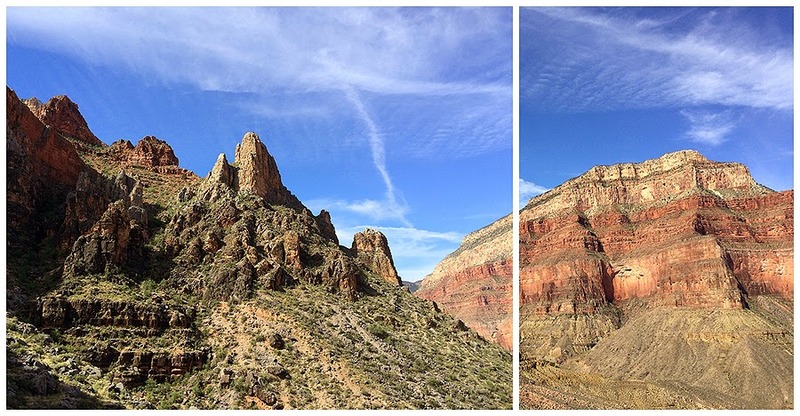 I would travel twelve miles along the Tonto Platform curving in and out below the high canyon walls while not gaining or losing much in elevation. I would pass by some campsites, dried up streams, interesting rock formations, all the while taking in super huge views of 'temples', 'towers', and 'pyramids' spotted across the way. Every once in awhile I would catch a glimpse of the Colorado River a few thousand feet below which was out of this world! 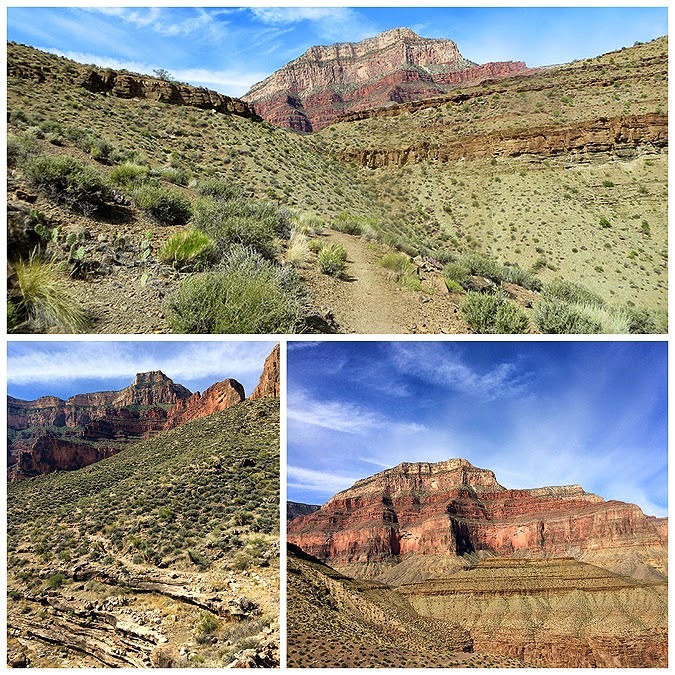 - The first mile and a half along the Tonto Trail curved around Cope Butte out into an exposed section of the platform before heading back underneath the high rising walls of the canyon as the trail made its way toward Monument Creek. Another interesting and horrifying aspect of hiking in the canyon is when you head back into a narrow section where the canyon walls rise up above you you'd figure there'd be shade in some places, not the case as you're almost always under attack from the sun, plus in these narrow sections the heat gets boxed in so it's a double whammy! Luckily I had plenty of water and it was only about 80 degrees, however 80 in the canyon is not to be taken lightly, it's not like 80 in Phoenix. - As I headed to Monument Creek I got to pass by the 'Monument' which is a cool narrow rock structure that stands hundreds of feet strait up just off the trail. There was also a patch of shade here, the last significant patch I'd see for miles! 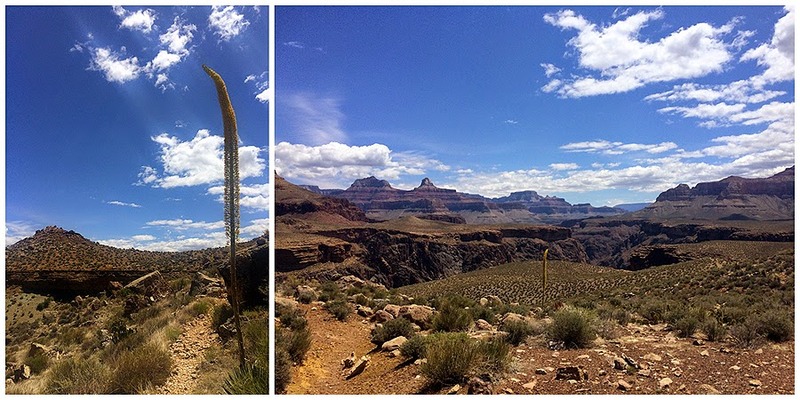 - There is a campsite near the structure that the Tonto Trail passes through, I ran into two backpackers here who pointed me in the right direction as the trail was a little confusing as it passed through the campsite. From here was the only real climb along the trail as it rises a few hundred feet from the drainage, here you get a good view back down to the campsite and the monument. 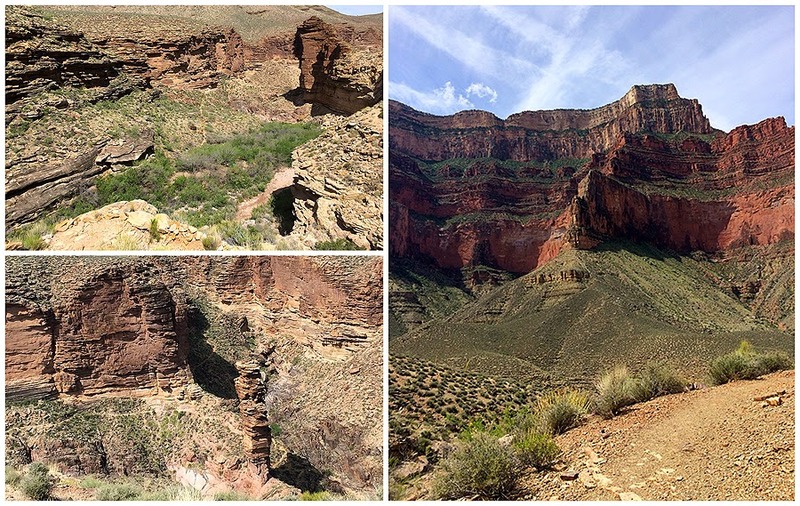 - Next up was more wandering along the platform in and out under the high canyon walls past Salt and Horn Creeks which also had primitive campsites. Once passing by Horn Creek the Tonto Trail curves around and below the 'Battleship' which is massive rising boheamouth of a rock formation. 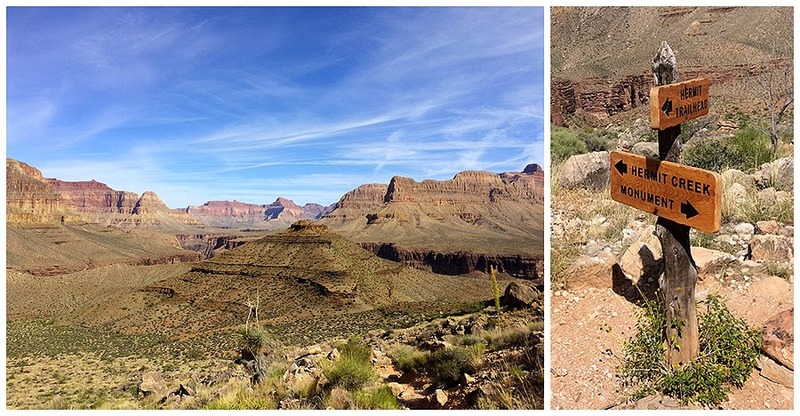 This was the most expansive platform section of the hike, too, as the Tonto Trail made it's way to the Plateau Point Trail. 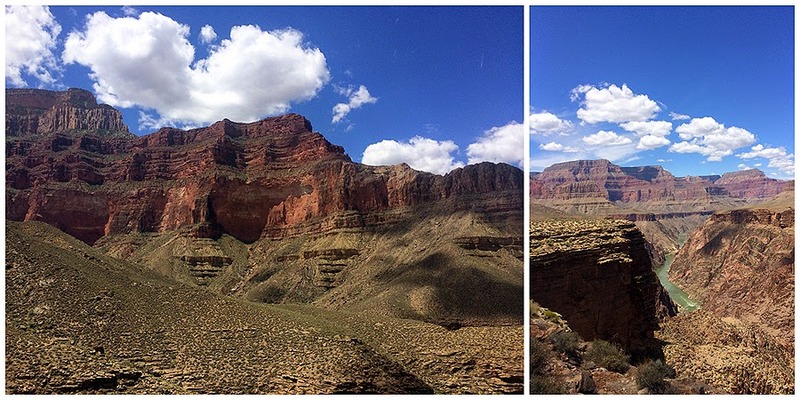 - Once on the Plateau Point Trail I headed over to the outlook and took a quick break. It was the middle of the day and it was pretty hot but it was still easy to relax and not feel uncomfortable. 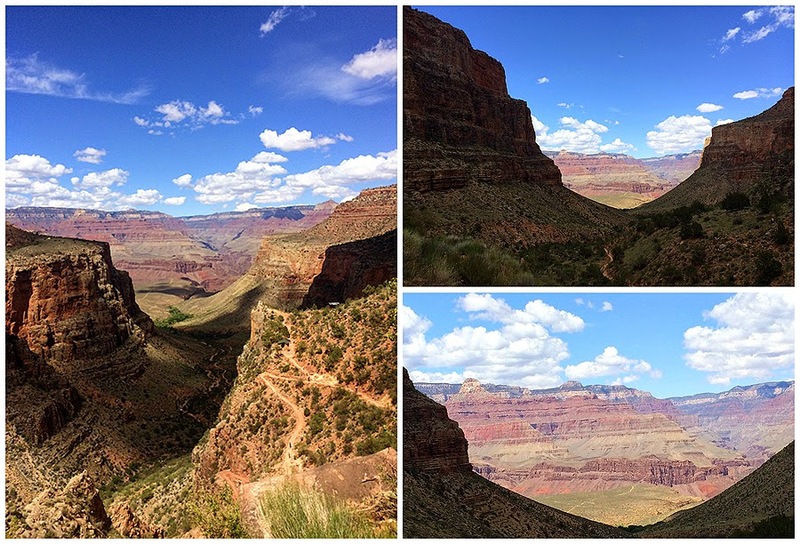 - Unfortunately, this would end my secluded day of hiking as I was now in the tourist section of the canyon. However, I have no issues with the masses, most are nice, some are clueless, and a few give me a good chuckle. 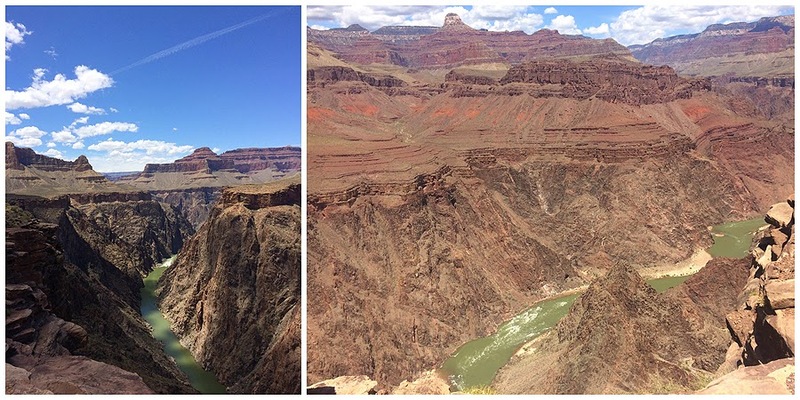 I just enjoyed the killer views down to the Colorado River before heading to Indian Gardens where I took one last break and filled up on water. 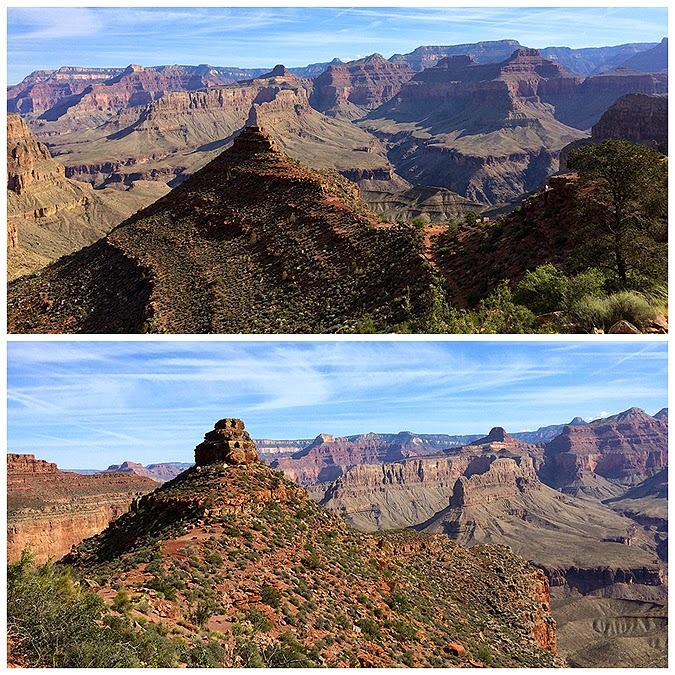 - From Indian Gardens to the South Rim is 4.5 miles up the Bright Angel Trail over dozens of switchbacks. 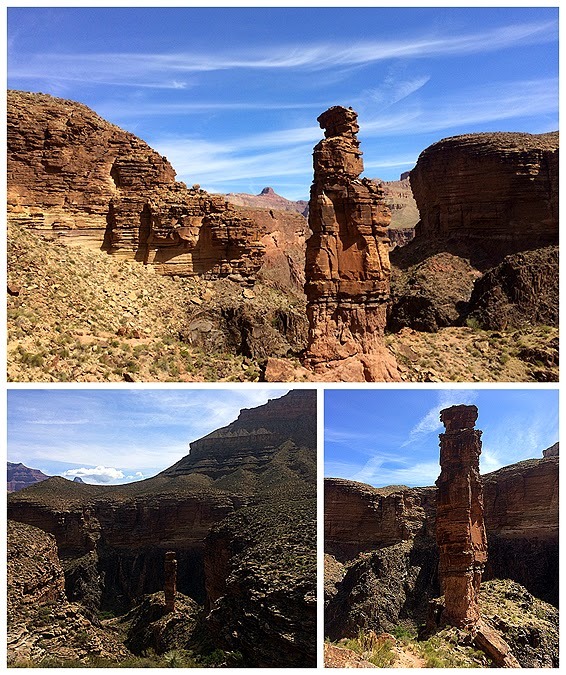 As the trail ascends the canyon walls start to close in on the trail but the view down to Plateau Point and across the canyon of the mysterious looking towers, temples, and pyramids are still in view and still look out of this world! 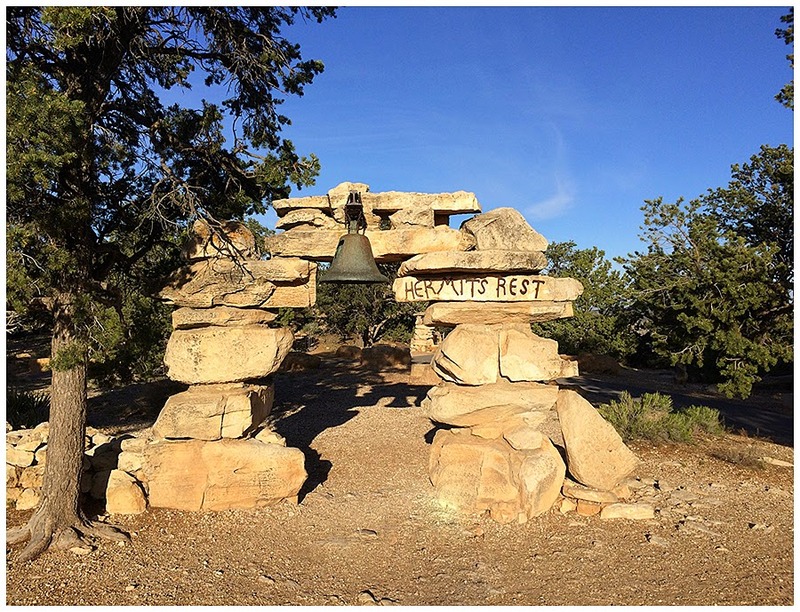 Hermit's Rest,the bell was retrieved from a Spanish mission. 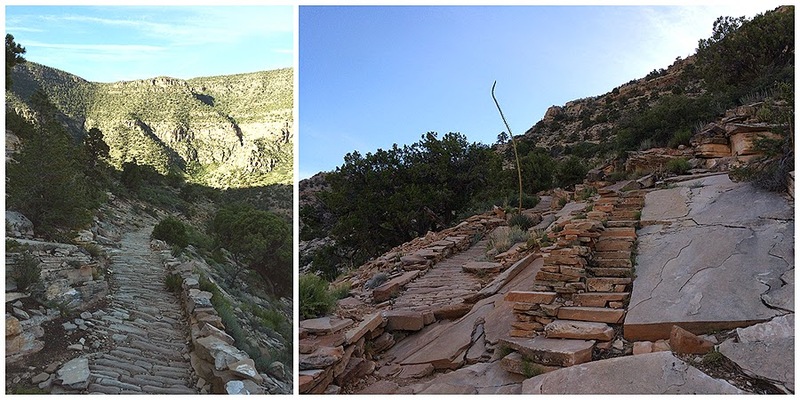 The old slab pathway of the Hermit Trail. 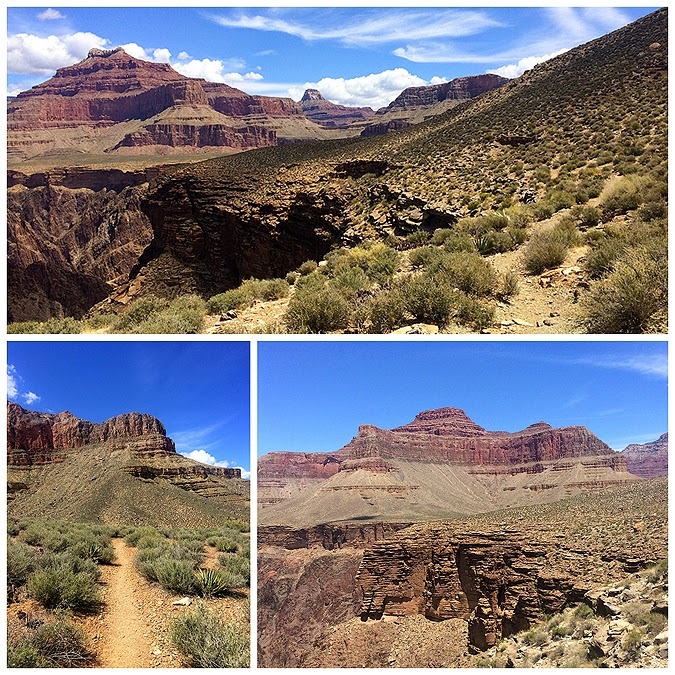 Most of this magnificent trail construction no longer exists because of erosion and landslides. Santa Maria Spring and rest house. Old bathroom below the rest house, I think. Spotted some nice colorful flowers along the way. After a mile or so you start getting the usual awe inspiring views. 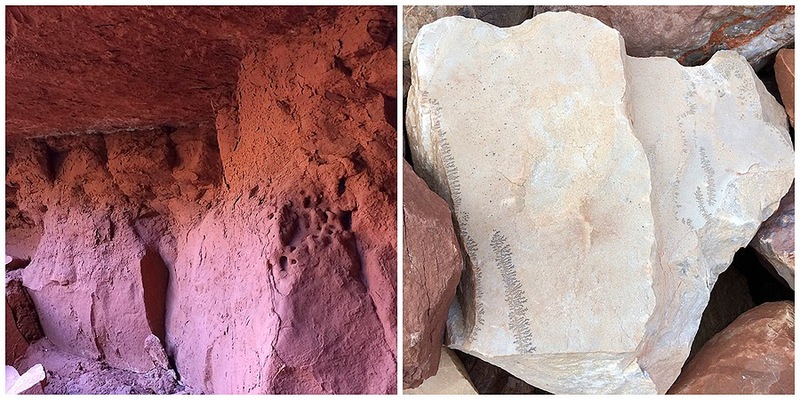 If you look closely you can spot fossilized prints from plants and animal tracks on rocks and neat formations in the clay covered walls. Descending along the high canyon walls on the Hermit Trail. Looking up to Yuma and Cocopa Points. The further you descend, the bigger the views! Cope Butte Comes into view, the trail descends below this. More views spotted from Hermit Trail. Looking back up to Cathedral Stairs and Yuma / Columbus Point. Once below Cathedral Stairs you can see a series of paths far below. This, I believe, its the old ranch site above Hermit Creek that was a big attraction in the early 1900's. Across the way the Tower of Set and Hours Temple loom large. View to the west and views up above. The final descent down to the junction with the Tonto Trail. 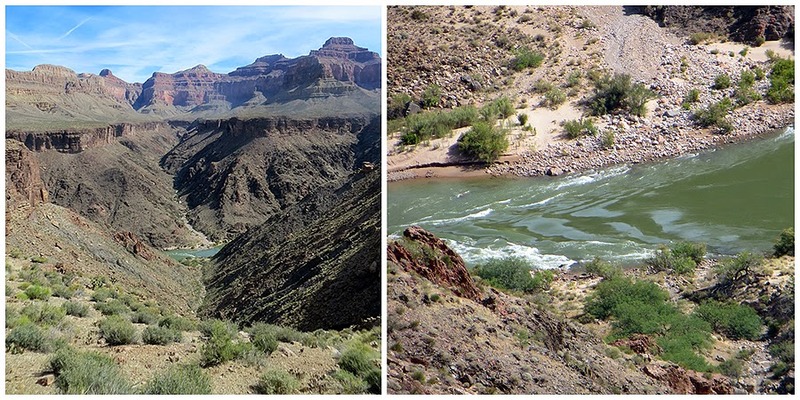 An unnamed drainage leading to the Colorado River. Heading in and out of Cedar Spring. Passig by the inferno on the way to Salt Creek. Salt Creek, doesn't have much going for it! 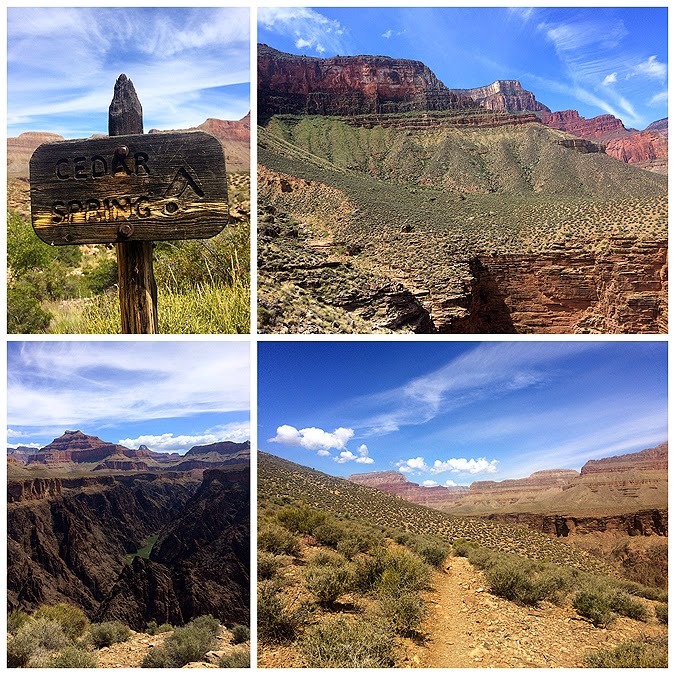 Next up is another nice open hike over to Horn Creek. This weed/flower is called an Agave. They're scattered around the open plateau's of the canyon and usually have a lone armored bumble bee buzzing in the vicinity. The footing through most of the Tonto Platform is superb and easy on the feet. Big view across the canyon to Isis Temple, I think. Every so often the Colorado comes into view a few thousand feet below. if you listen closely you might even hear it from certain spots. The hike into Horn Creek is between Dan Butte and the Battleship. 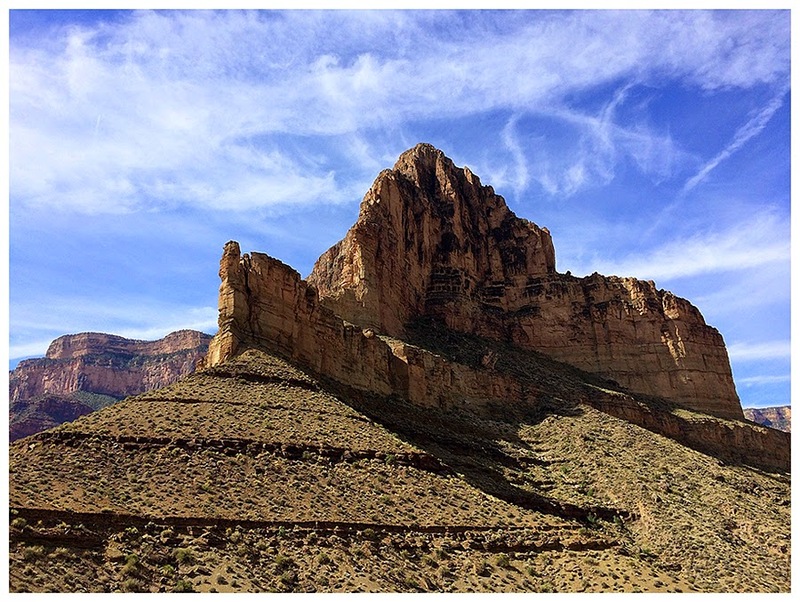 Making my way over to Plateau Point. 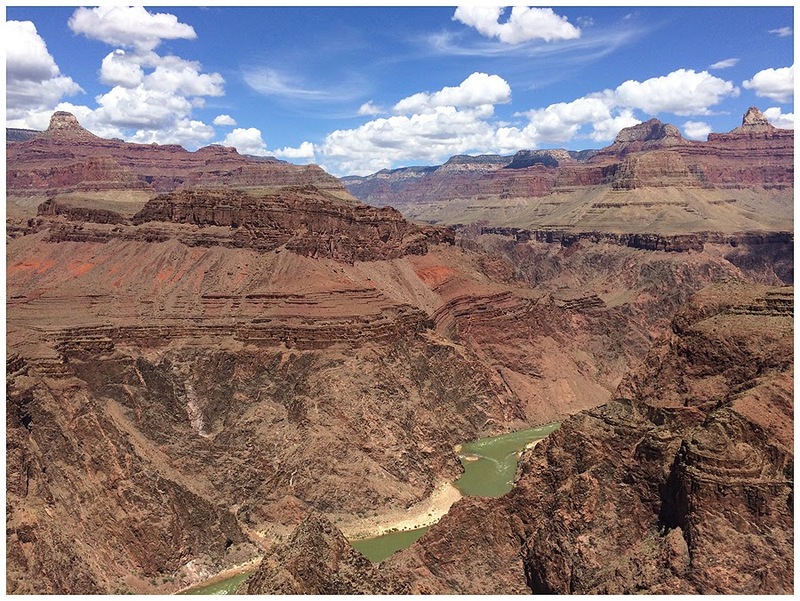 Nice view of the river from Plateau Point. 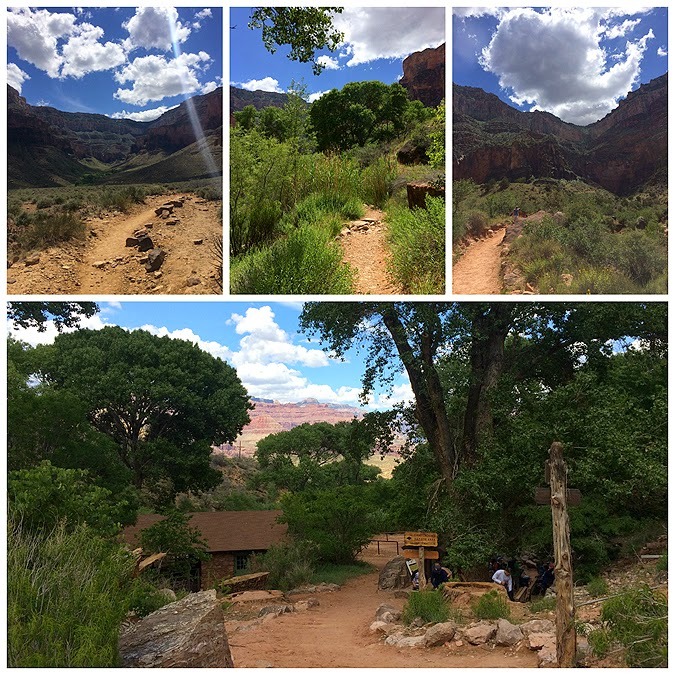 The hike in and out of Indian Gardens. Lots of signs as you pass by Indian Gardens. The name of the game for the last 4 miles is switchbacks, switchbacks, switchbacks! 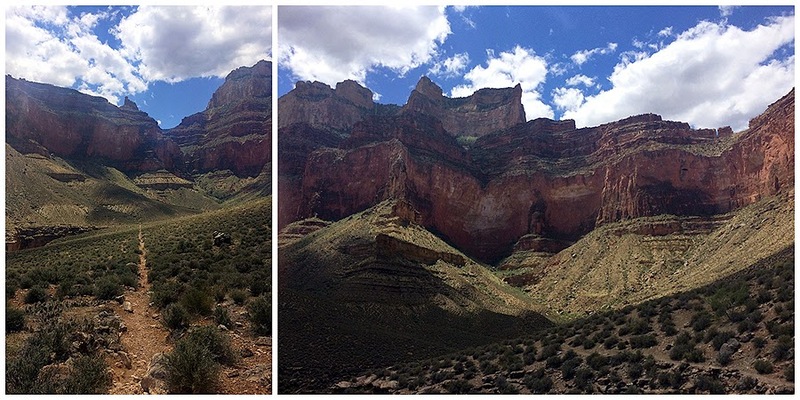 Looking back down to Indian Gardens and Plateau Point. 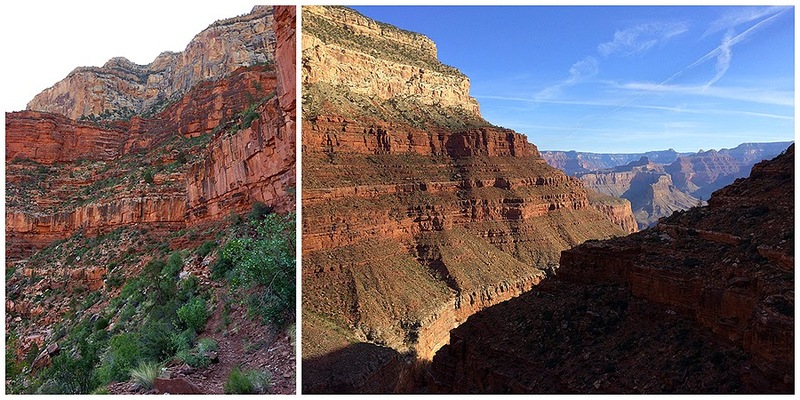 The canyon walls start to creep in as the Bright Angel Trail makes its way back up. The home stretch to the top! 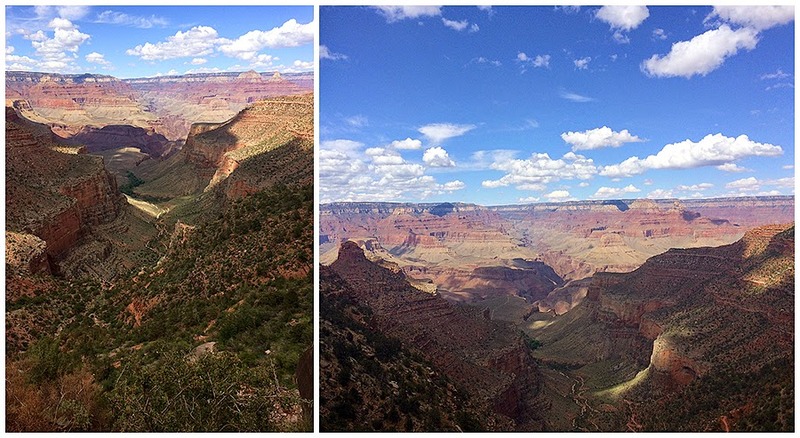 The final view from the South Rim. 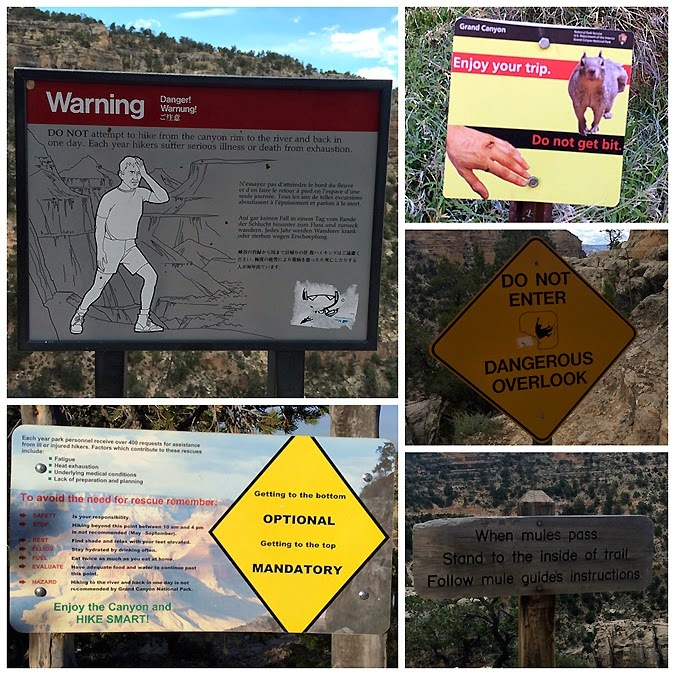 Signage near the rim, warning people to be careful. Absolutely beautiful pictures! 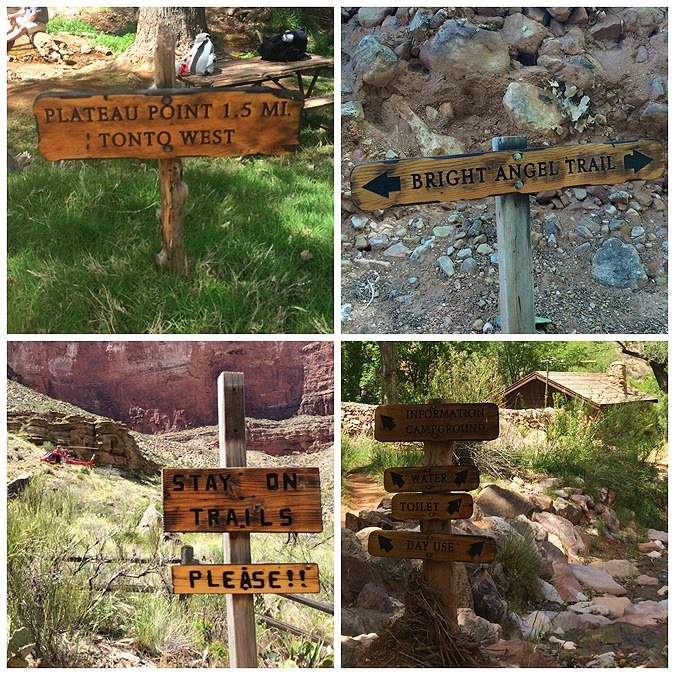 I love the old, weathered trail signs! 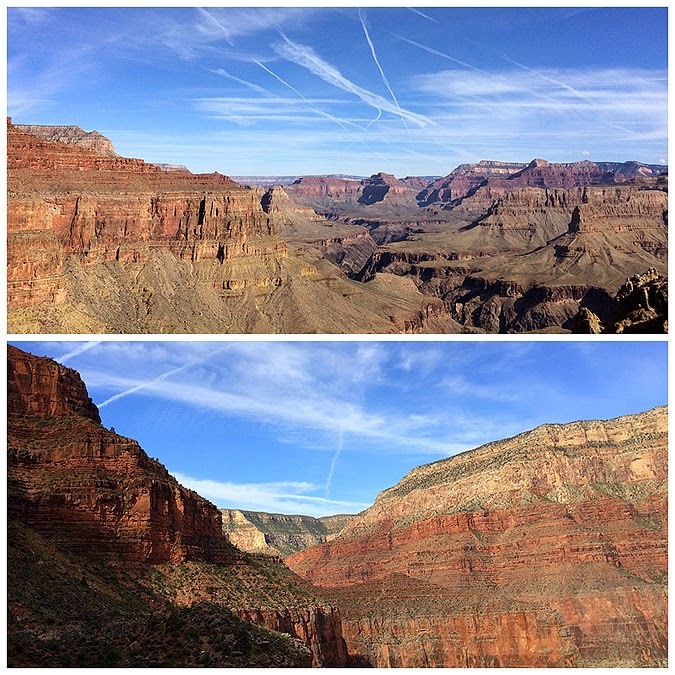 Great photos and landscape, Chris! Thank you for this trip report and photos. 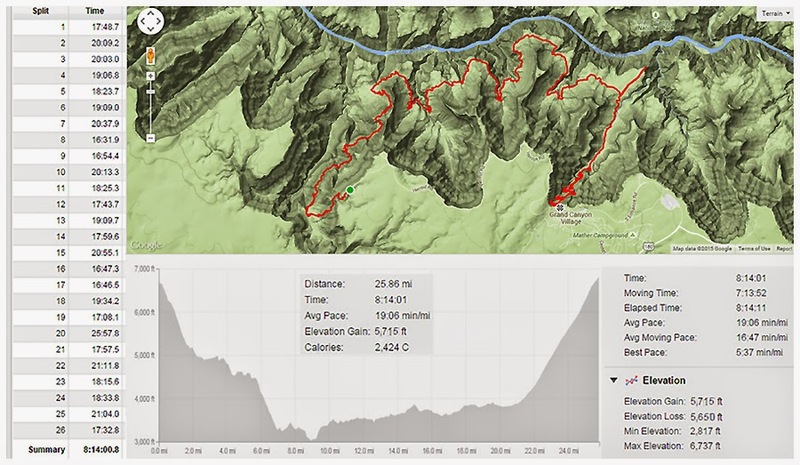 This and some of the stuff on YouTube give me the confidence to try this hike next month. 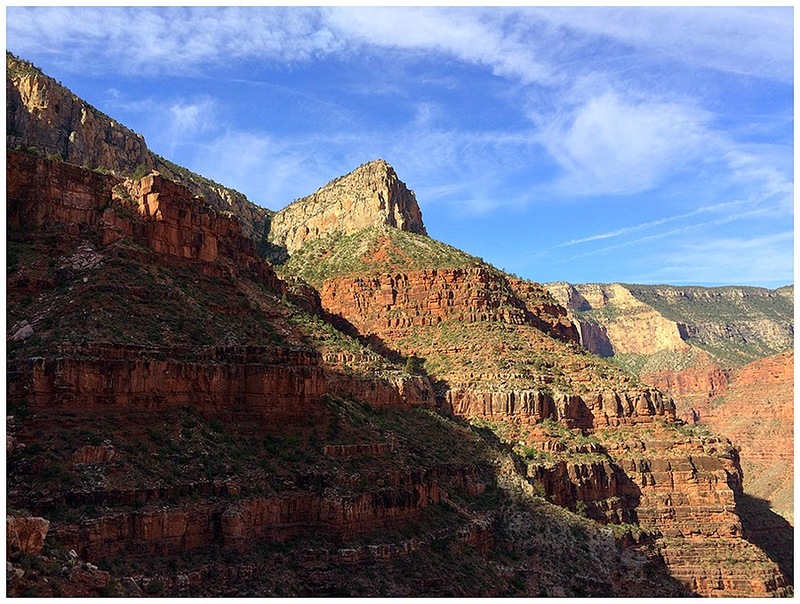 I've taken many hikes in the canyon but only on the corridor trails (Bright Angel, N. and S. Kaibab); I'm very much looking forward to a hike where I can enjoy some quite and solitude. 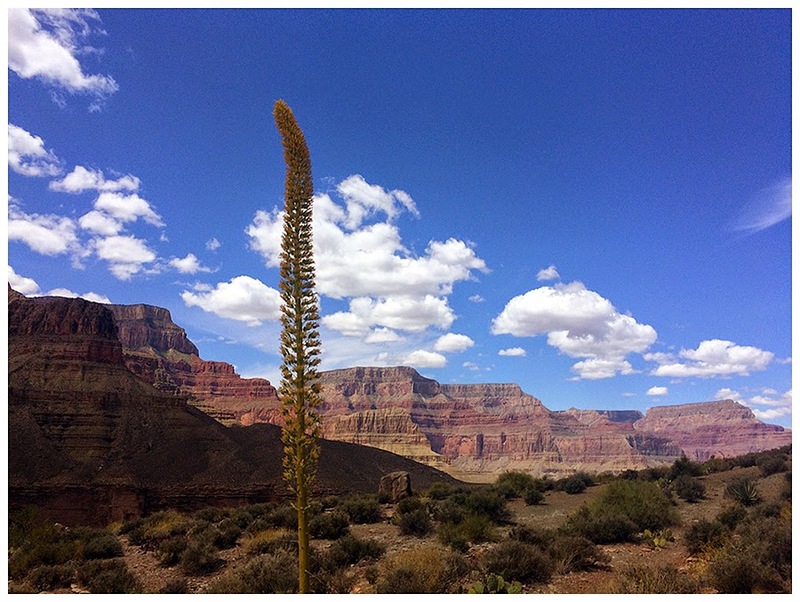 Also planning a S. Kaibab/Tonto/Bright Angel day hike this trip! Thanks again! Glad you like the report and got some useful info from it. 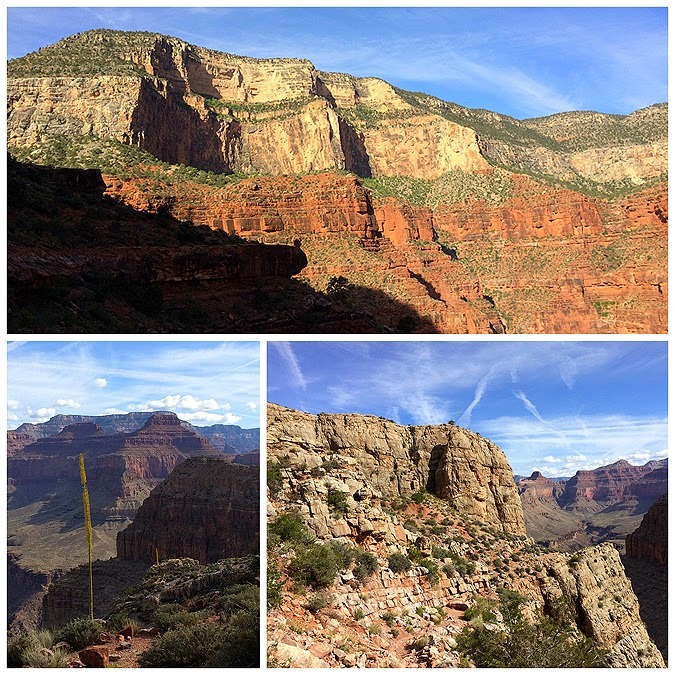 Enjoy the solitude along the Tonto Platform, you're going to have a great hike! !